My very first themed day for the children was Space Day. I'm not sure what gave me the idea to start organising themed days, but it may have been because it was the last summer before Harry started school, and I wanted to make the most of our time together at home. I also wanted to find things that both children could do together, not always easy with a stubborn toddler. I spent a bit of time beforehand browsing Pinterest for space themed crafts and activities. I also took a lot of inspiration from the Twinkl website, always my first port of call for themed resources. The children were so excited to see the breakfast table on Space Day, covered in tin foil and their space themed toys. 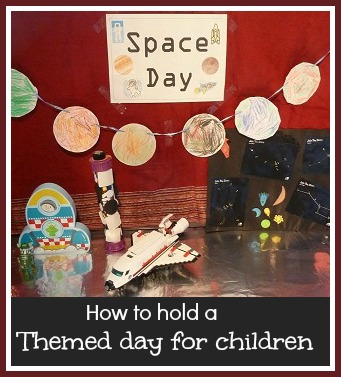 Space Day was such a success that we continued that summer and beyond with a whole series of themed days - you can find a link to them all at the bottom of this post! A successful themed day is all about the planning, and it makes any day go much easier if you have a list of activities to keep everyone busy. I make sure that we have everything that we needed in advance, and everything was printed out ready. Our first activity is often some kind of poster. This is a great activity because it involves painting a large sheet of paper, which children of all ages enjoy. Even better if the weather is nice so you can do it in the garden and it will dry quicker. While the paint is drying you can work on the other elements of the poster. For example, for Dinosaur Day we used these fab free dinosaur colouring pages. Younger children can help with the colouring and older children can cut them out and position them. Then I try to have some kind of play activity, a sensory activity if possible. For our Beach Day we made sandy play dough together and gathered together a selection of beach related small world play things. For Antarctic Day we made up some fake snow and played in it with the toy cars. 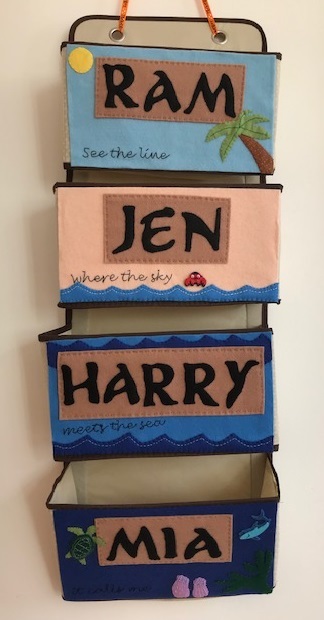 I also like to have at least one craft activity on hand, perhaps with several different elements that can be worked on separately and combined together. For example the paper plate aquarium from our Under the Sea Day has Hama bead fish and a painted paper plate frame. I also always include a themed baking activity. On Dinosaur Day we made a dinosaur shaped cake, on Antarctic Day we made snowball cake pops. Even if you just make shaped biscuits and ice them in appropriate colours it's still fun. Finally I make sure that we have a selection of printable activities to do when something quieter is needed. Twinkl is great for this, they have resources on just about any theme that you can think of. For younger children colouring sheets or pencil control worksheets work well, older children enjoy themed work searches or other puzzles. You can find colouring pages on almost any subject online. I also line up a selection of books from our bookshelves which fit in with the theme, however tenuously, and leave them around for the children to browse. Our themed days have been a lot of fun. The children have really loved them, and they've been educational too!